Why is website navigation so important? The importance of website navigation is critical when it comes to distinguishing your brand. An organised and transparent navigation system acts as a road map to direct visitors to various pages and information on your site. It is fundamental in encouraging visitors to stay, peruse your content and have a positive user experience, which subsequently leads to more sales and brand loyalty for your business. What should be included in your website navigation. How to create a positive browsing experience for your customers. Website users typically want to know 3 things during their visit to your site: ‘Where am I?’, ‘Where have I been?’ and ‘Where else can I go?’. By visibly demonstrating these answers within your navigational structure, there is a higher chance visitors will remain on your site for longer, reinforcing the likelihood of a valuable sale. What should be included in your navigation? With so many website pages, it can be difficult to identify where items should appear and whereabouts they fall in level of importance. According to Orbit Media, seven navigation items are the optimum number to ensure search engine optimisation (SEO) is aligned and usability best practices are met. Nevertheless, when deciding what makes the navigation cut, different opinions will inevitably unfold among stakeholders about the best choice. However, the answer essentially lies with your website visitors and their use of your site. Permitting your marketing software features, a ‘Conversion Assists Report’ is a great source to help determine the best items to be included in website navigation. It helps identify the most popular pages viewed by those visitors who converted into sales. Pages that tend to be viewed most by these customers include product/service pages, case studies and pricing. If you don’t have access to conversion assist reports, you can use the Google Analytics ‘Visitor’s Flow Report’ to help inform your decisions. The difference between the two, is that this report doesn’t separate traffic into standard visitors and customers. However, it can graphically demonstrate how people use your site including the path they follow from the original source to each page they visit until they exit. This feature can be found under the content menu in your Google Analytics reporting account. Now we’ve established the importance of website navigation and the methods to help you decide on navigation items, let’s look at some website navigation best practices to ensure a positive browsing experience for your customers. Website users tend to be impatient and have little tolerance for a site whose usability is complicated and unclear. Visitors are usually there for a purpose, like finding information on your product or service or to read your content and case studies. Position the navigation bar where users expect it, horizontally along the top, or vertically to the left or right of your homepage. Make sure navigation is placed in the same location on every page of your site. Consistent use of colours, design and font will help visitors become familiar and feel at ease when browsing. If navigation was to change in position or style on each page, users will be left confused and be more inclined to search elsewhere where the layout is more transparent. Psychology studies state that people tend to be more receptive to the first and last items in a list. Known as the ‘Serial Position Effect’, the human brain retains information based on the order it appears, which is the first and last item in a list. Relating this data to navigation structure, place the most important items at the beginning and end of the list, with everything else in between. Your ‘Contact’ tab should be kept last. Try to steer clear of using overly generic wording in your navigation structure. Words like ‘Resources’ or ‘Tools’ often aren’t clear for the user and require multiple clicks to determine what content is enclosed. Using more precise names such as ‘Blogs’, ‘News’ or ‘Case Studies’ take visitors directly to that page, avoiding any unnecessary confusion. Note: Strong website navigation plays an integral part in Search Engine Optimisation (SEO). If you want to rank highly on search engines like Google, be specific! Imagine how frustrating it is to land on a website to be faced with multiple choices and uncertainty over where to click. Which page should you go to first? This sort of confusion will only encourage your visitors to exit your site. As previously mentioned, seven has been found to be the magic number when it comes to navigation items. This is based on studies that state a person’s short term memory can only recall seven items. Take the exact number out of it and the key takeaway here is less is more. 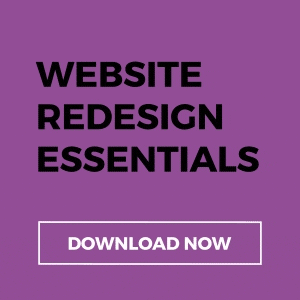 Looking for some website inspiration? Check out 5 of the best B2B websites. When visitors complete an action on your site, they often don’t know what to do next. Instead of allowing them to exit, why not suggest a few follow up options to complete their user experience. Did they read a blog? Suggest similar topic guides or videos they might enjoy. Offering next steps is especially valuable for users who are new to your site, who tend to be unsure of what they’re looking for. Similarly, adopting the ‘Next Post’ or ‘Next Product’ feature works well for companies who share multiple content posts or have numerous products. Users can easily click through until they find exactly what they’re searching for. Common sense reinforces that well-structured navigation is essential to provide your visitors with the best browsing experience possible. However, by applying some of the methods mentioned above, you can encourage better engagement and higher conversion rates on your website by using navigation best practices to enhance your overall user experience.